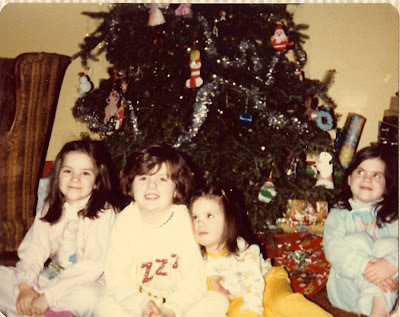 My sister, way over on the right there, just posted all kinds of adorable photos on Facebook from our childhood Christmases. I figured I'd just let her do all the work (finding, scanning and posting) and I would just copy and paste - hey, that's what sisters are for, right? Thanks Katy! I hate to brag but can you believe how cute we were? I just can't help but smile when I see these pictures. That's me way on left in my Holly Hobbie jammies - loved those. Christmas is so much fun with little ones around. I used to feel a little sorry for grown ups at Christmastime - boring gifts and fewer of them, so much work while we had all the fun. Little did I know that it actually gets more fun when you get to watch those tiny creatures that you love so much light up on Christmas morning. That is the real magic of Christmas. Yes, you four are adorable! And I don't blame you one bit for letting your sister do all the work of finding, scanning and posting. I did that for my daughter's birthday one year and one day's work yielded surprising few photos - but worth it. Hard work, so kudos to Katy!